THE UGLY CARROT: The ugly carrot is an affordable produce delivery service that aims to provide the convenience and value of make at home meal kit services like Blue Apron at a price point that’s attainable for low-income families. 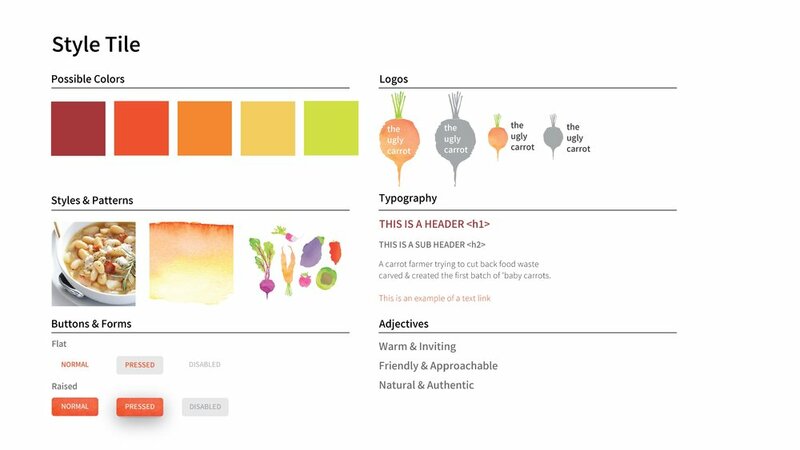 RESPONSIVE WEBSITE PROTOTYPE: Designed to be attainable by low-income families. rather than start with a mobile app for onboarding and tracking orders, I started by designing a responsive website to reach those with limited smart phone accessibility. BAG PROTOTYPE: I designed a reusable bag to help reduce the waste associated with delivery services. The bag is also insulated to keep deliveries fresh during the day. SYNTHESIS: We visited local food hubs, restaurants, grocery stores and farmers markets, interviewing customers and food experts. We used this data to find trends in food habits and create How Might We statements and Ad Hoc Personas. GUIDANCE MATERIALS: I created produce guidance sheets, recipes and shopping guides to help customers get the most out of each weeks delivery. IDEATION: Using How Might We statements and our personas, we ideated and brainstormed ideas and directions for this project, then each went with an idea we were passionate about. For me that was increasing access to fresh and healthy food and reducing food waste. The ugly carrot is an affordable produce delivery service that aims to provide the convenience and value of make at home meal kit services like Blue Apron at a price point that’s attainable for low-income families. Food, nutrition, and health are three big passions of mine. I started this project with an interest in understanding more about the food habits of city dwellers, with the goal of designing something to help people make eating healthy more of a priority. In researching for this project, I collaborated with two classmates, Lizzie Garrett, and Alagu Chockalingam. We started by surveying people in our networks, using this data to take a deeper dive into patterns we found interesting like make at home meal kits and food access. We visited local food hubs, restaurants, farmers markets and grocery stores (high-low end) and observed and interviewed patrons, tested make at home meal kit services, and interviewed subject matter experts. We synthesized the data, and used this to create Ad Hoc Personas, and How Might We statements that guided ideation, sketching and helped us each to take independent directions moving forward. I chose to design an affordable produce delivery service that helps to increase healthy food access to families living in low income neighborhoods. For this project I designed, prototyped, and branded several touchpoints for this service including the kit itself, educational materials, and a responsive mobile website. I started by refining my concept using storyboarding and a business model canvas to create a viable business model. I created a service blueprint to better understand all the touchpoints and support processes of this service. Using these tools I then created a customer journey which I used to identify the minimum viable product and began working to prototype and refine those touchpoints through user testing. I created mood boards and style tiles to help me craft a unique product branding and use consistent visual design throughout multiple touchpoints. This project taught me that a great experience is in the details. Having the opportunity and freedom to craft a complete experience from zero really taught me how much goes into creating a complete customer journey, let alone a great one. I wish I had been able to explore more of the customer service interactions, especially those addressing issues, errors and feedback, because these details are what create a truly enjoyable user experience. STORYBOARD: I used a business model canvas and storyboarding to help me refine my concept and start building out the touchpoints and experience of this service.. 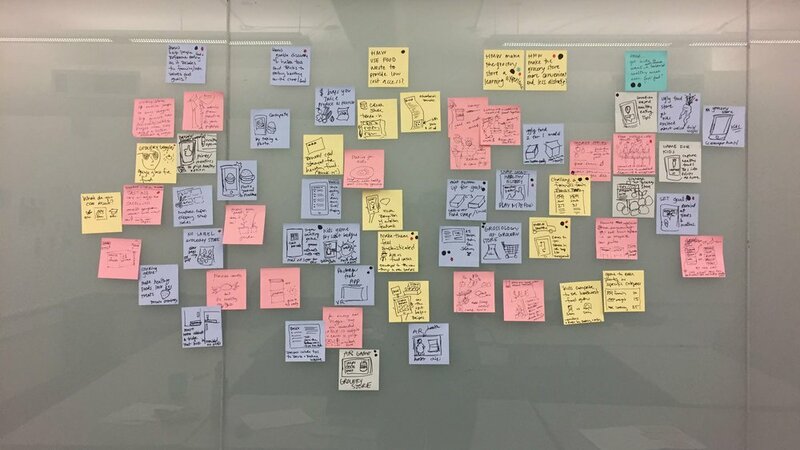 USER JOURNEY: Using a service blueprint to flesh out the touchpoints and support processes, I created a user journey to help me identify the minimum viable product and guide my prototyping. 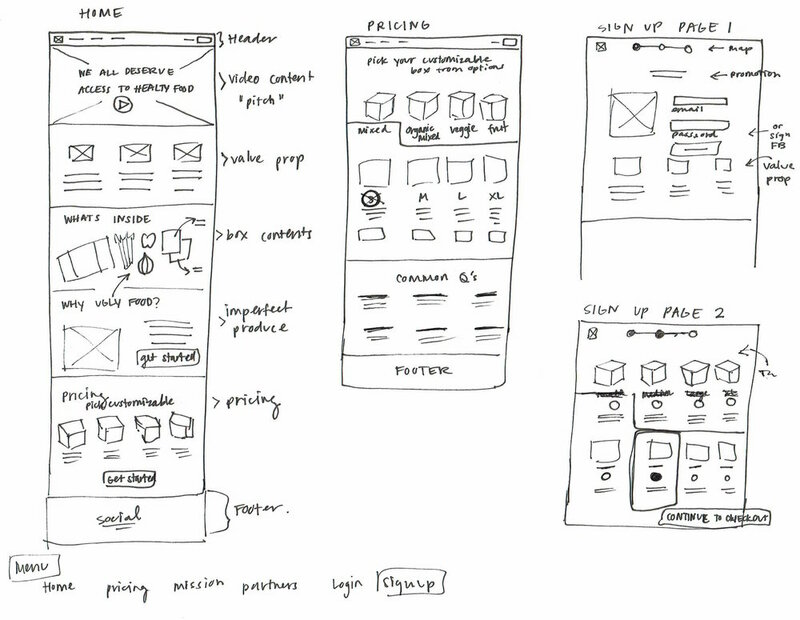 WIREFRAMES & USER FLOWS: I used wireframes and user flows to design the responsive website. BRANDING: I created a moodboard to capture the look and feel of the brand, then created a style tile to document the design principles and ensure consistency across my touchpoints. PROTOTYPING: I created rough prototypes of the bag and guidance materials binder to help illustrate the value and test the service with potential users.